*Carnitas are slow-cooked, spicy, shredded pork shoulder. This recipe uses the same flavors, but applies them to ground pork. It's not the same of course, but it's considerably faster, very tasty, and perfect for this recipe! *The rice, filling, & sauce are also awesome wrapped in flour tortillas or prepared enchilada-style! *You will only use half of the prepared rice (Arroz Blanco) in the filling. The rest can be served on the side or at a different time. It's even more delicious when mixed with cheese! *If you prepare the filling in advance so that it is cold when the shells are stuffed OR if you prepare the recipe in advance through Step 19, additional cooking time will be required. 1. For the Rice: preheat the oven to 350°. Place a medium oven-safe stock pot or Dutch oven over medium-high heat. Add the oil. 2. Once the oil is hot, add the rice, the onion, and the garlic. Reduce the heat to medium. 3. Cook, stirring often, until the rice has turned opaque and the onions have softened. You are not trying the brown the rice or onions. 4. Add the broth, lime juice, and salt. Stir to combine. Increase the heat to high. When the liquid begins to boil, place a lid on the pot and transfer it to the oven. 5. Bake for 15 minutes. Remove the pot from the oven, stir the rice mixture. Replace the lid and return the pot to the oven. Bake for 15 minutes more. Fluff the rice mixture with a fork. Transfer the rice to a plate to cool. 6. Meanwhile For the Pork: in a small bowl, combine the coriander, cumin, oregano, salt, garlic, pepper, paprika, and onions. Set aside. 7. Place a large nonstick skillet over medium-high heat. Add the pork. Cook, crumbling the meat as it cooks, until the pork is no longer pink. Remove the pan from the heat. Drain any excess oil. 8. Stir the spice mixture into the pork. Add the orange juice and broth. Return the pan to medium-high heat. 9. When the mixture comes to a simmer, reduce the heat to medium-low. Simmer, stirring occasionally, until most of the liquid is gone. 10. Transfer the meat mixture to a plate to cool. 11. Meanwhile For the Sauce: melt the butter in a large saucepan set over medium heat. Add the onions and peppers. Cook until the vegetables are just beginning to brown around the edges. 12. Add the tomatoes, garlic, cumin, cayenne, and salt to the saucepan. Stir to combine. Add the broth to the pan. Simmer for 10-15 minutes or until the sauce begins to thicken. 13. Transfer the sauce to the bowl of a food processor (or blender). Process until smooth. Set aside. 14. Boil the shells according to manufacturer instructions, adding 1 tbsp of salt and 1 tbsp of olive oil to the water. Shells should be just under al dente (aprx 9 minutes). Drain. 15. In a medium bowl, combine the pork, 1/2 cup of the cheddar, 1/2 cup of the mozzarella, and half of the rice. Toss to mix. 16. Spread 1 1/4 cups of the sauce over the bottom of a 9" X 13" baking dish. 17. Spoon filling into the shells (each shell should be all the way full) and place them into the baking dish (they will be fairly tight-packed). 18. Spoon the remaining sauce over the tops of the shells. 19. 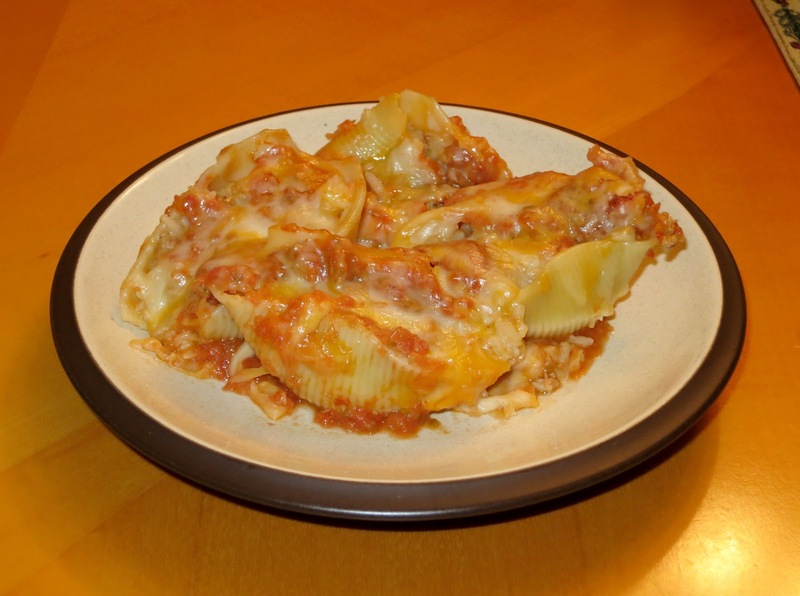 Sprinkle the remaining cheddar and mozzarella evenly over the tops of the shells. 20. Cover the baking dish with foil and bake for 10-15 minutes or until the cheese is bubbly. Uncover the dish. Bake for 5 more minutes. 21. Let rest for 5 minutes. Serve!